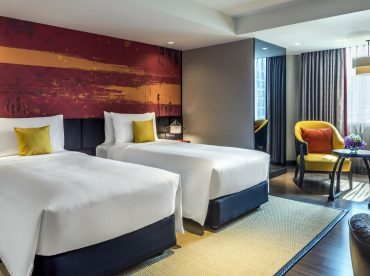 Mercure is a new hotel opening in Bangkok 2017, and has 232 rooms as well as a variety of world class facilities including the breathtaking rooftop swimming pool, an executive club lounge with business centre facilities, a modern fitness centre, and two restaurants and bars. Thai design elements and thoughtful amenities await you in Mercure Bangkok Sukhumvit 11’s spacious rooms and suites. Choose a connecting room for family holidays or a suite for a romantic weekend getaway. 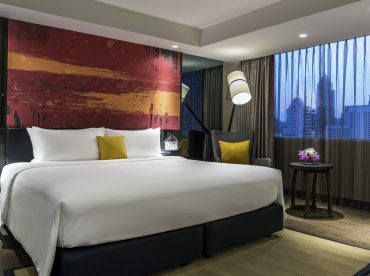 Mercure Bangkok Sukhumvit 11 features a variety of room types to suit your different budgets and needs. Guestrooms are air-conditioned and have contemporary interior design with modern necessities to satisfy the need of all kinds of travellers. The rooms are well furnished and have many in-room amenities such as a large-screen TV with cable channels, Wi-Fi access, an electronic safe, and a working desk. The hotel also provides a range of onsite facilities and services to keep guests happy and satisfied. Visit the wellness centre to stay in good shape and enjoy fun workouts at the fitness room or just dive into the pool to get away from Bangkok’s heat. Staff of the hotel are sincere and are at the reception to assist you with travel information, excursion arrangements, or any other requests you may have during your stay. The Deluxe room with twin beds offers calm neutral tones and at least 34sqm of space, and a Deluxe room king bed is also available. The beautiful views of Bangkok’s most exciting neighbourhood are the first sight you will see when you wake up. Step into your en suite bathroom for a refreshing shower. Complimentary Wi-Fi keeps you connected at the spacious workstation, while a 43-inch TV helps you to relax after a full day of meetings or sightseeing. Connecting rooms are available for families and friends travelling together. 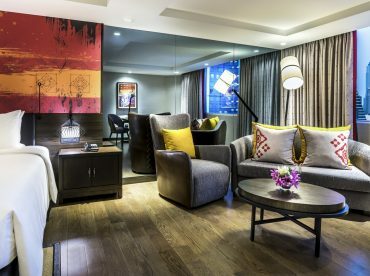 Enjoy the facilities of family room Bangkok that Mercure offers. Start your morning by heading to the hotel’s fitness centre for a workout. Bath amenities are there to add a fragrant touch to your post-gym shower experience, while complimentary Wi-Fi services will deliver the daily news directly to your smartphone or tablet. Rooms are available designed for people with reduced mobility. The Privilege Twin Room of the hotel provides up to 48sqm of space. Use the onsite amenities to enjoy a cup of coffee from the espresso machine, and the Bluetooth connection to your TV to play your favourite music. Your stay also includes access to the hotel’s Privilege Club. 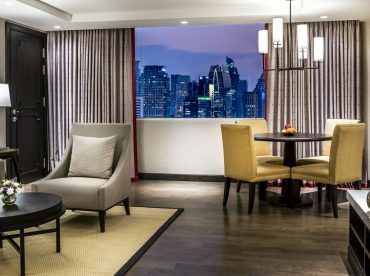 Here, you can experience the business services at their finest and savour complimentary afternoon tea while admiring the city skyline from the 15th floor. In the evenings if you feel like staying in, order room service and enjoy the contents of the free in-room minibar. Elegant silk hangings add a touch of Thai heritage to the sleek modern design of the Privilege King Rooms. Begin the day with a delicious complimentary breakfast in the Privilege Club lounge. In the afternoon, ask the concierge to book a massage at nearby Sofitel Bangkok Sukhumvit, our sister hotel, and then freshen up in your spacious bathroom before dinner at El Gaucho restaurant. 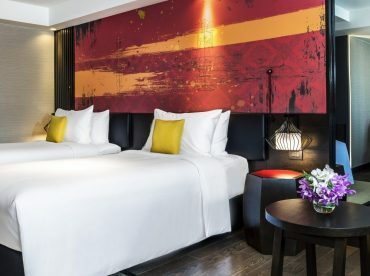 Being one of the Bangkok hotels with 2 bedroom suites, expect authentic Thai-style furniture and top-floor city views. With 87sqm of space and a king-size bed, these rooms are ideally suited for honeymooners or those seeking a romantic weekend getaway. Put the Bluetooth music connection to good use when entertaining friends and family in the separate living room, or enjoy a moment to yourself with a fresh cup of coffee from the espresso machine. It’s one of the Bangkok hotels with club rooms and one of the Bangkok hotels with executive lounge. The best club lounge in Bangkok involves the Privilege Club’s access to complimentary breakfast, high tea and evening cocktails overlooking the Bangkok skyline in the private 15th-floor lounge. The club is open daily from 6am to 8pm.